Robyn, the person who posted this grasshopper on FaceBook, thought this grasshopper looked like a rainbow, and it sure does. Technically it is a plains lubber, Brachystola magma. This colorful grasshopper is a horse lubber, Taeniopoda eques. 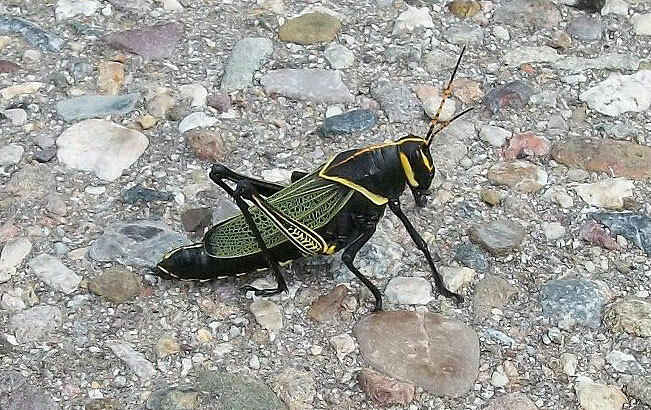 Lubber grasshoppers are active in Arizona in late August and September. Because of their big size, high numbers and bright coloration, people have a lot of questions about them. Understandably, there is some confusion about what a locust really is. A locust is a type of grasshopper, but not all grasshoppers are locusts. A locust is a kind of super grasshopper that is highly mobile, and forms large swarms with high numbers of individuals. Often the species that are considered to be locusts undergo physical and behavioral changes when they reach high populations, becoming an enormous eating machine. Lubbers are basic grasshoppers. They are not locusts, per se. 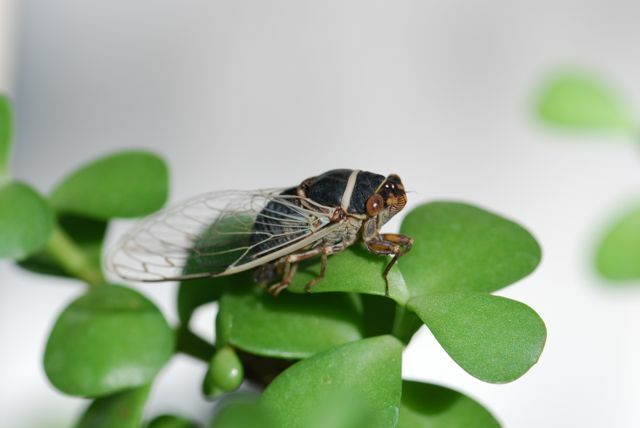 Sometimes people use the term locust for cicadas. Cicadas are in a totally different order of insect. They don't have jumping legs or chewing mouthparts like grasshoppers do. This is a cicada. Cicadas have clear wings and sucking mouthparts. They are related to aphids and leafhoppers. They are not grasshoppers. 3. What do lubber grasshoppers eat? This is a very good question. Despite the name "grass"-hopper, these insects eat a wide variety of plants. They tend to land and nibble a little here, and then hop over and nibble a little there. The plains lubber above is said to favor wild sunflowers. The horse lubbers feed on plants that contain toxins. The lubbers take the toxins into their bodies and become toxic themselves. Their black and yellow coloration is a perfect example of classic warning coloration. As an interesting aside, both of these species are truly omnivores, not herbivores. That means that if lubbers encounter a dead or dying insect, or even other forms of "meat," they will consume it. 4. Where do they come from? Grasshoppers are highly mobile and can travel great distances, as well. Pallid-winged grasshoppers from the western coast of California have been found all the way in Hawaii. 5. I have noticed sounds when grasshopper are around. What is that? Males lubbers and other grasshoppers make noises that sound like buzzes or clicks to attract females. The horse lubbers sit on trees and rub their hind wings on their front wings. 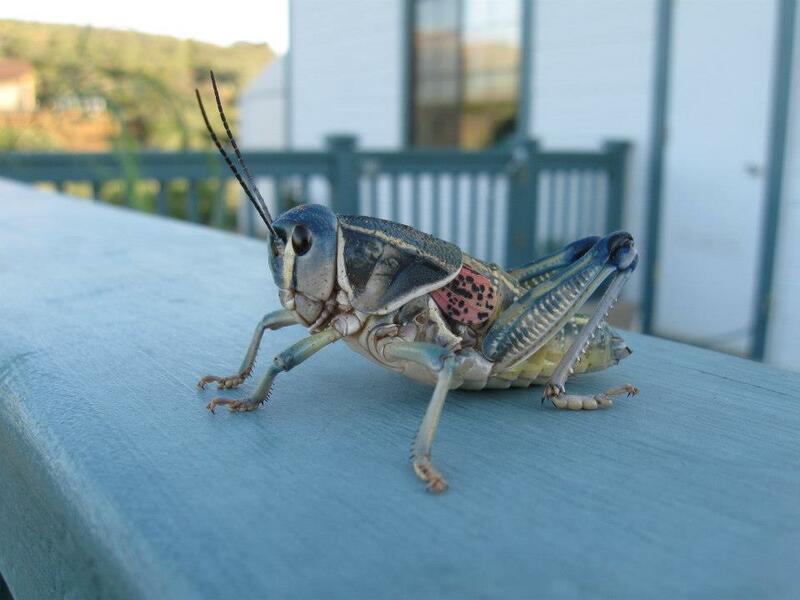 Have you ever seen a lubber grasshopper? Do you have any questions about them? great photos! I love lubbers. I just found a three inch lubber on the window of petco, I captured in a jar and melted whole in the jar for air and then I put gras and sticks in it. They are not poisonous unless u eat it while it is still alive and it does not have those lil pinchy things to bite u with. I am sure they little bugs like crickets and flies and mealworms and u can get all those at the pet store. I'm sure if you keep giving it fresh grass and leaves it will be fine. For several years now we have had a huge Lubber species that's supposed to be found in Florida. It looks different than the one posted. The largest one I've hosted was at least 6" long and and inch wide. Somehow they've found their way to central-east Texas. We start out with lots of black nymphs with a red stripe down the back, but only end up with a few adults. Their like pets that live on the porches and I have yet to see them eat any plants, so they aren't destructive in that way. I was wondering due to their large size if they did eat smaller insects or worms. I enjoy them since they are so interesting and so few of them. Interesting. It may be you don't see them feed because they only take a bite or two and then move on. They are big and active. I've seen an old print that shows a grasshopper eating another insect, but I've never seen them eat anything but plants. Found this post when I went looking for more information on Plains Lubbers. Turns out they will eat road kill! Oh yes, some grasshoppers have a quite "varied" diet.